The Cross River State Police command has arrested one Mr Daniel Bassey for allegedly giving away his two-year-old son to a trafficking agent in Port Harcourt in exchange for money.Mr Hafiz Inuwa The Commissioner of Police who paraded the suspect on Tuesdaysaid the man was arrested on July 23 in Calabar after a report was made by the mother of the child, Mrs Magdalene Bassey. Inuwa explained that the mother of the child reported that her husband, Mr Daniel Bassey, gave out the child to a trafficking agent for or N180, 000 to help him pay his house rent. 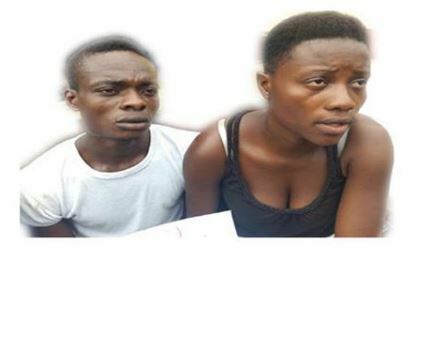 “The duo are now in police custody to unravel the cause of this inhuman action and possible prosecution,’’ he said. “I did it based on the debt of N21,000 I collected from a friend to pay my house rent and I have no other valuable thing apart from him. So I used him as collateral to get the money to clear my debt. . There is no work in this rainy season, so I am unemployed. A guy from my area informed me that he knows a woman who lends money to people. .
My friend told me that I can give out the child as collateral to get the money without necessarily selling him. The woman gave me N180,000 immediately after she received the child. .